Have Opened Reservations Through July 14th. Many stern spots are still open.. Fishing's been kind. Some have a limit of sea bass most everyday. Have lots of spots open..
20,906 Reef Blocks deployed at numerous sites.. TNC's Restoration Reef 278 - Doug Ake's Reef 3,447- St. Ann's 2,022 - Al Giles/OC RUST Reef 1,601 - Eagle Scout Reef 970 - Sue's Block Drop 593 - Nichols' Concrete 1170 - Capt. Bob's Inshore Block Drop 813 - Benelli Reef 418 - Capt. Bob's BG Reef 902 - Wolf & Daughters Reef 458. Recent Blocks Supplied By Frank Graziano -- Thank You! Have a line on 4 or 5 tractor trailer loads of unwanted block. Will see how that goes! 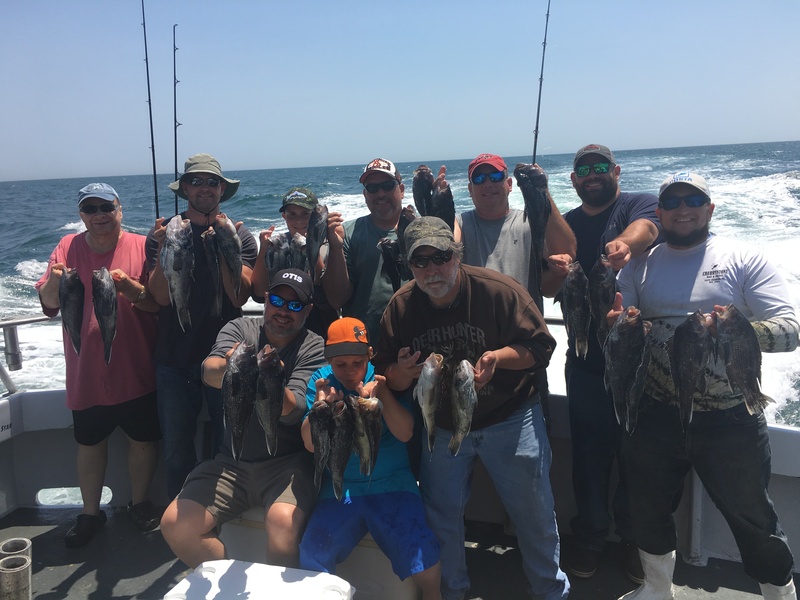 Have a few aboard with limits of sea bass most every trip. Though the weather has not been kind, fishing has. Seems like fishing ought to hold a while more. Thursday's rail is especially light though the weather looks great; Friday has room, Saturday too. Saturday afternoon it looks like a classic NE'ster sets in. That may actually help in the long run, but certainly not for the immediate future -- looks like a big wind. Fish usually bite before a blow. 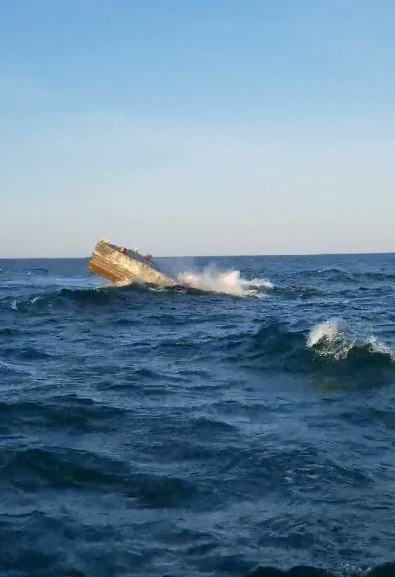 The Ocean City Reef Foundation sank a 60 foot steel barge at the Bass Grounds Reef Friday evening 5/25/18. It joins the Capt. Bob Gowar Memorial Reef Group. . I anticipate it will become a very toggy/coraly place. Have two more barges in the pipeline for this year, plus one of our largest reef projects ever; the Bass Grounds Reef Restoration boulder reef. The next barge we sink will be what I anticipate will become one of our finest sets -- Jack Kaeufer's Memorial Reef. His memory demands it..
Year by year, projects add up. We're going to leave more coral than we found - time to Put Back. ocreefs.org - 501c3 - We build reef.